Can we get it on Android though? 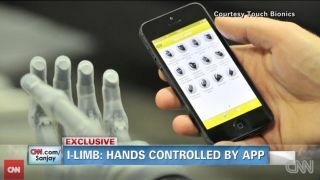 A man has been given a pair of bionic hands that are partly controlled by an iPhone app, allowing him to enjoy the closest thing to fully-functioning hands in four years. Four years ago, 34-year-old Jason Koger was involved in an accident that left him with both hands amputated, but he's now been given a pair of highly-advanced bionic hands designed by Touch Bionics in the UK. The accompanying iPhone app offers 24 different grips to choose from - all he needs to do is tap the corresponding icon. "For the first time in five years I can hold my daughter's hand," said Koger. "I can't tell you what a gift that feels like." See? Technology isn't always so sinister.